There are over 313,000,000 people living in the United States. Of that population, less than 1% claim farming as an occupation (and about 2% actually live on farms). The concept behind my picture is that small farming in US is not that popular anymore. 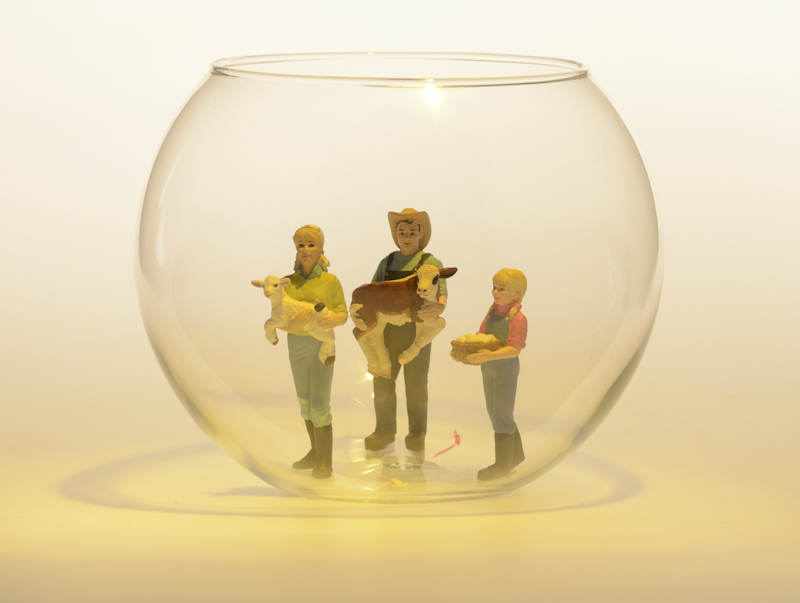 So, I wanted to show the isolation of farming by putting the farmers in a bubble. The reason why I gelled my light yellow is because yellow I wanted to create the feeling of golden age of farming in America. The yellow can also symbolize the sun that is a sign of prosperity. I added to my caption really interesting data that I found online on the governmental Agriculture department, only 1% of the US populations doing farming as a primary occupation. They say that small family farms are still more popular than the corporation farming, however, small is not that small anymore. They have associates and it became more business oriented – and the new technologies involve less labor work. This picture can be also about the organic food. The farmers are holding the lamb and calf and eggs – almost like praising them. I feel like this doesn’t happen anymore in nowadays society. The respect to the occupation itself and the respect towards the animals are gone. We have big farms and terrible conditions. Furthermore, the quality of the food that we consume decreased. Everything farmers produce needs to be at a big scale in order to be productive and cost efficient. In 2007, only 45% of farmers claimed farming as their principal occupation and a similar number of farmers claiming some other principal occupation. The number of farms in the U.S. stands at about 2.2 million. For the purposes of the U.S. Census, a farm is any establishment which produced and sold, or normally would have produced and sold, $1,000 or more of agricultural products during the year. (Government subsidies are included in sales.) By that definition, there are just over 2.2 million farms in the United States. According to the 2007 Census of Agriculture, the vast majority of farms in this country (87%) are owned and operated by individuals or families. The next largest category of ownership is partnerships (8%). The “Corporate” farms account for only 4% of U.S. farms and 1 percent are owned by other-cooperative, estates or trusts etc. However, the term “family farm” does not necessarily equate with “small farm”; nor does a “corporate farm” necessarily mean a large-scale operation owned and operated by a multi-national corporation. Many of the country’s largest agricultural enterprises are family owned. Likewise, many farm families have formed modest-sized corporations to take advantage of legal and accounting benefits of that type of business enterprise.